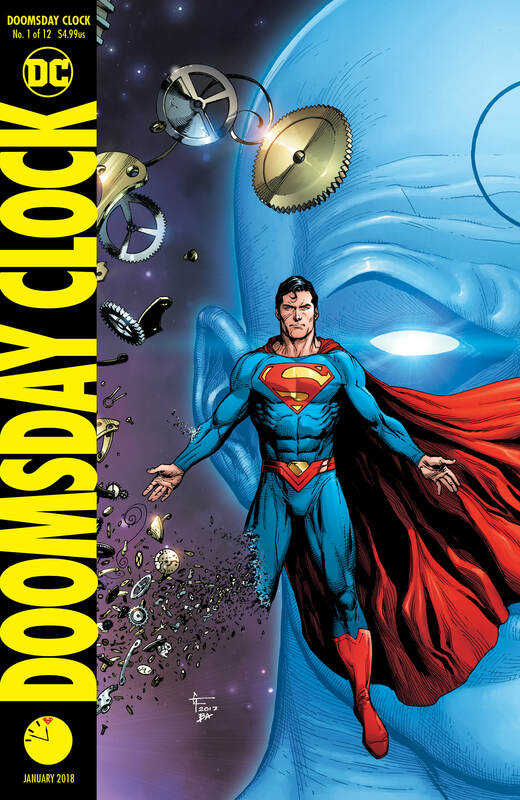 Today sees the release of the first issue of The Doomsday Clock, DC’s eagerly-anticipated (?) Watchmen follow-up. From the original Rebirth special to the “Button” crossover between Batman and The Flash, the Watchmen DNA has been deeply ingrained in the post-Rebirth universe, albeit in a fairly ambiguous sense. This new series seeks to crystalise their involvement just a little, and in the interest of providing as wide a range of opinions as possible, we threw it open to a few of our best and brightest reviewers to share their thoughts on the first issue. 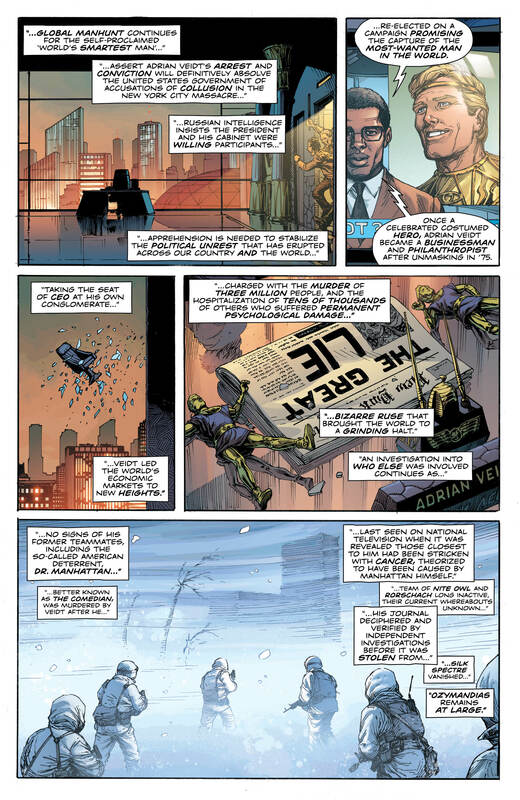 Geoff Johns is trying do the impossible: capture the tone of Alan Moore and marry it with the DCU. And he comes very, very close in this first issue. 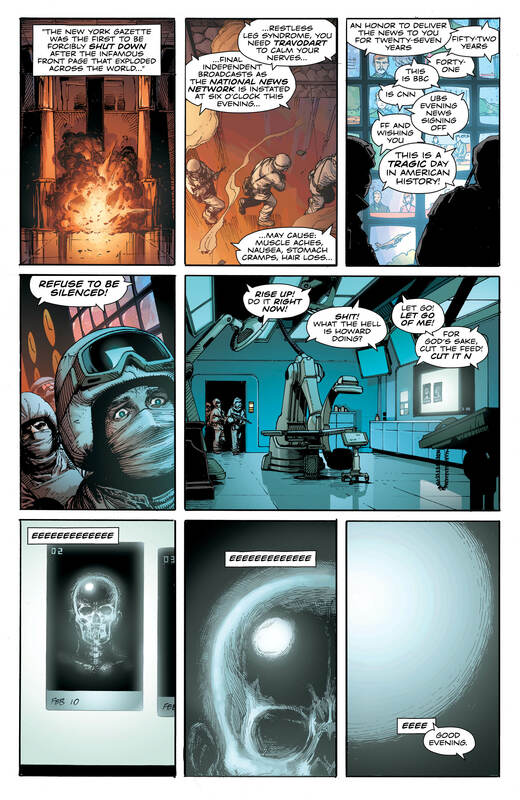 Johns teased his love of Watchmen way back in New 52 Green Lantern #17, depicting the hand of creation as being awfully big, blue and familiar. Is New 52/Rebirth Dr Manhattan’s pet project? Time (as long as Rorschach’s watch isn’t running too late) will tell. 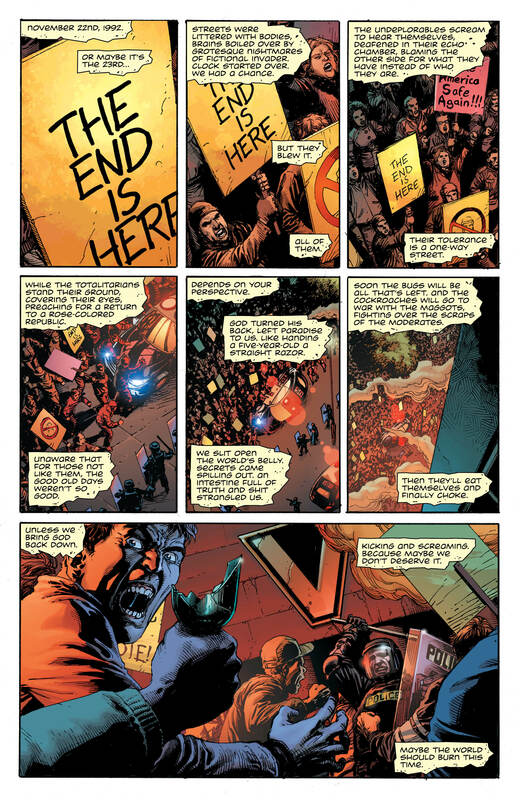 But Doomsday Clock absolutely captures the despair at contemporary politics, along with clearly setting this as a sequel to the Watchmen comic (as opposed to the film) from the first frame. And, crucially, by the end, we are reminded of something else vital that has rarely been explicitly mentioned of late in Rebirth – Superman is not our Superman, but himself (and his family) a refugee from another reality. It’s bold and ambitious, but never feels gratuitous (even the smattering of ultra-violence). It may struggle to sustain this, and marry the two universes, but still. I expected to be unconvinced, or at least wary. What a book! DC have been on a roll with their books in the last few years and this looks to be the cherry on top of the cake. The issue takes Watchmen and spectacularly merges it with the modern day world to create a frighteningly possible scenario. Johns also keeps things feeling fresh, and it doesn’t feel that there have been decades since the original Watchmen first came out. Remember that time we were all clamouring for a sequel to Watchmen? Yeah, me either. Alan Moore’s masterpiece has been held on a pedestal for many years now, and left (almost) untouched. So it’s a bold move on the part of Geoff Johns to not only write a sequel, but to involve it in main DC continuity. There are a couple of real stand-out moments, a lot of set pieces being set up, and a couple of instances of fan service. With old-school nine panel grids, lots of dark and gritty dialog, the team of Johns and Frank have definitely captured the essence of Watchmen, and while I feel it missed the mark ever so slightly when compared to the original, there’s only one issue so far. It’s like comparing a match to a bonfire. The match just might get there, you just need to give it time. I’m interested, it has grabbed my attention, and it’s something new. That’s always something to celebrate. A Watchmen sequel? Well okay then. First off, there are definitely some interesting ideas at play here. 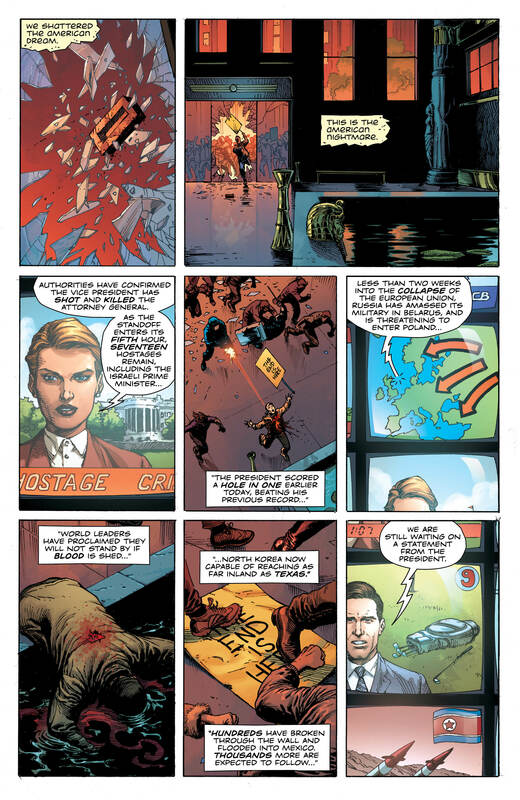 And while a lot of it falls into the realm of “setting Watchmen in the terrifying modern day political climate”, the (apparent) return of Rorschach and the ambiguity of his actions helps keep the pages turning here. Geoff Johns’ writing credentials are pretty much unquestioned, but there’s still a faint, nagging feel of ‘Watchmen fan-fic’ throughout this first issue that, for me, was difficult to shake. It’s a well-written issue for sure, but it does feel at times more like a writer trying to do their best Alan Moore impression instead of staking their own claim to the story. That will change in time, of that I have no doubt, but for the time being it’s proving to be a bit of an awkward transition for this particular comic book fan. 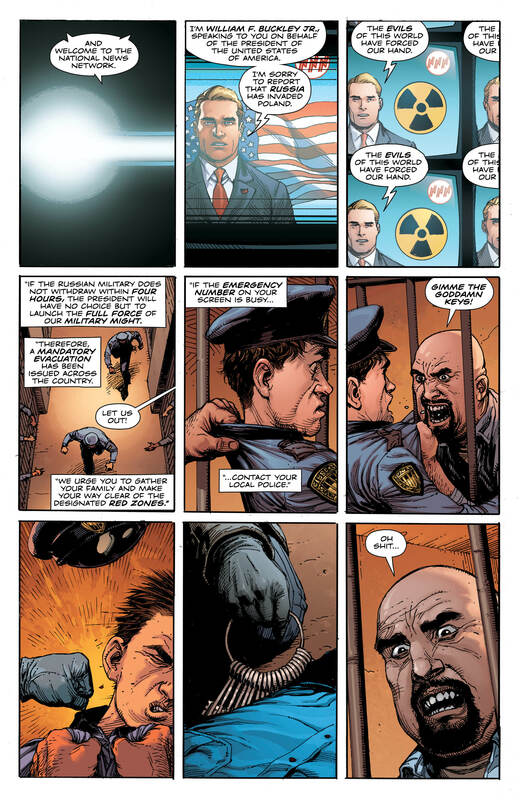 Visually, Gary Frank does a typically slick and polished job, but his style almost feels a little too slick and polished for the down-and-dirty world of the Watchmen, y’know? For me though, the most interesting part of the story comes in the final four pages as we check in with Superman himself as he struggles with a strange, unfamiliar feeling. And that’s the interesting part of this whole series for me. Not to see the Watchmen set in the modern day, but to see how this iconic world manages to integrate itself with the main DC continuity, and to what extent that integration actually happens. A solid opener with some great moments then, and, minor niggles aside, I’ll definitely be following the rest of this series as it unfolds. While I think most of us were almost dreading more Watchmen, you have to commend the bravery of taking on the evidently poisoned chalice of such a celebrated, overanalysed and contentious title. However, on the basis of this issue, Geoff Johns and company have downed that bitter poison and metabolised it into something both flavoursome and healthy. The artwork and lettering are reminiscent but not carbon copies of the original, new characters consistent with the universe of the classic are introduced well while old characters reappear changed by time and experience. Then they tease a cross-universe tie-in that has me salivating at the prospect of the guy in red & blue tangling with the big blue guy amongst a gamut of interesting mash-ups. It’s worth saying that the Watchmen-DCU mash up by itself would seem cheap if the story, character and world building wasn’t being done well, but they ARE being done well, so I’m all on board with this. Watchmen has a timeless quality but is indelibly linked to the fears and prejudices which characterised the world in the late 80s, but Doomsday Clock manages to tweak that sense of tension and bring it right up to date, in keeping with a world once again seeming to spin off its axis. My fears of a milquetoast corporate cash in have been calmed somewhat and I have to say that this is an atmospheric and compelling first issue, both visually and thematically appealing and setting the stage for a story I want to read more of.